Like the redesign? me…. NO. CNET Asia Community Blog Entry – Problems with Google Calendar Since 30 November, How Long Does It Takes For a Fix from Google? My new entry over at CNET Asia Community Blog is up. This week’s entry, “Problems with Google Calendar Since 30 November, How Long Does It Takes For a Fix from Google?”. Click here for the full read. Author Peter iNova brings years of motion and still photography experience to the production of Photoshop Actions. The complete iNovaFX collection of CS5 Actions are include, ready to be loaded into your copy of Photoshop where they can work their magic to amplify your images. Interactive eBook – 284 pages with interactive features customized for iPad, laptop and desktop reading wherever you are. 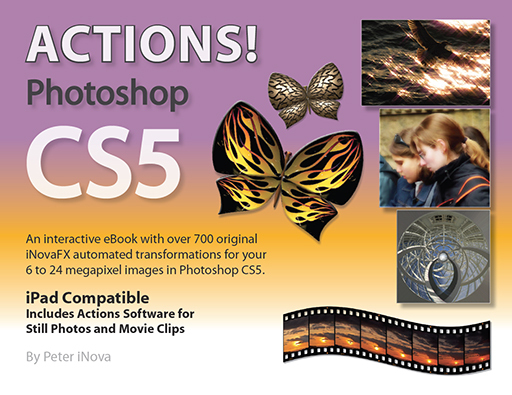 700+ Actions – Original iNovaFX Actions that expand on Photoshop CS5’s existing tools. 8 Chapters – Filter Effects, Borders, Repairs, Enhancements, Artistic Conversions and more. Ultra Resolution Viewing over 500% on your computer or iPad screen—pixel-free. Actions for Movies — A wole chapter on new Actions for use with HD movie clips using Photoshop Extended CS5 (50+ movie Actions). Photoshop Actions Included – 101 folders of completely original Actions ready to be used in Photoshop CS5. (Many work in Cs3/4). Adobe Reader Viewing Software weblocs included for Windows, Macintosh, Unix and Linux. Live Hyperlinks to cross references and Internet resources give instant access to examples, accessories and updated pages. Get your copy from this link, http://www.gmbooks.com/product/CS5.html.